The Norway rat is the largest commensal rodent and the most common in the temperate regions of the world. Norway rats are nocturnal and very cautious, often shying away from new objects and changes. Outdoors: Norway rats nest in burrows in the soil along railroad embankments, stream/river banks, piles of rubbish, under concrete slabs, etc. Burrows will have at least one entrance hole and one emergency exit, usually hidden in grass, debris, etc. Because they are social animals, several burrows will often be located in one area. Indoors: Norway rats only need a half inch (12 millimeters) opening to enter a building. They will nest in basements and lower portions of buildings in undisturbed piles of debris or merchandise. On occasion, they can be found in attics, roofs, and other high places, as well as sewers in older urban areas. Norway rats, like house flies, are attracted to garbage. Because of this, they can contaminate food and food surfaces. They also cause considerable damage by gnawing – including entrance holes into and within buildings. Shaggy brown fur scattered with black hairs; gray to yellowish white underside. 7-9 ½ inches (18-25 centimeters) with a tail length of 6-8 inches (15-21 centimeters). Adult head and body measure 7-9 ½ inches (18-25 centimeters) with a tail length of 6-8 inches (15-21 centimeters); weighing 7-18 ounces (200-500 grams). Coarse, shaggy brown fur scattered with black hairs; gray to yellowish white underside. 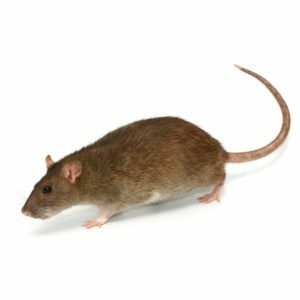 While they will eat pretty much everything, Norway rats prefer meat, fish and cereal when going through garbage. Pregnancy lasts 23 days, with the young born blind and naked. Hair appears in about seven days and eyes open in 12 to 14 days. They are weaned at three to four weeks and reach sexual maturity at two to five months. Females can have three to six litters per year each containing seven to eight young. Adults live five to 12 months. They have poor vision and are color blind, but have heightened hearing, smell, touch and taste. Touch is via their vibrissae or long whiskers. They are good runners, climbers, jumpers and swimmers. Control is difficult where there are sanitation issues and access to a structure is not eliminated, especially older structures.